Here is a quick look at baseball's history around the time period that the Monitor and Merries recreate at their matches. For some essential further reading, please scroll down to the bottom of this page. The story of the early years of baseball and how it became known as our "national pastime" is truly fascinating. It is also filled with legend, boastfulness & outright fabrication and has caused a considerable amount of controversy among historians. Throughout the years, many stories have been told of how it came to be, and many different men have been proclaimed "Father of Baseball." However, most of these stories have given way to an understanding that the modern game of baseball has roots that go back hundreds of years, and is a product of contributions made by many different players, organizers, promoters and clubs. Most historians agree that the sport is how it is now by way of a gradual "evolution" rather than by a miraculous inception. 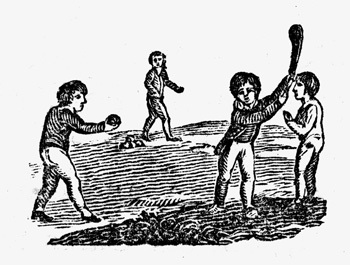 Woodcut from A Pretty Little Pocketbook, England 1744, an early reference to "base-ball"
Stick and ball, safe-haven games have been played for thousands of years in various parts of the world, dating back to ancient Egypt. In the New World, games such as cricket and rounders that came over from England were gradually joined by many variations of "town ball"-style games. Rules and structure of these games were as varied as the towns they were played in, and the games were purely amateur, often largely played by children. A lot of townball games made no restrictions on how many players could play, did not include any sort of "foul" ground and wouldn't be over until an agreed-upon number of innings were played or runs scored. In many variations, a runner could be put out by being hit by a ball thrown at him. This was called "soaking" or "plugging." Yowza! However, beginning in the mid nineteenth-century, groups of gentlemen looking for recreation began to form clubs and start to write down rules for the game that we now know as baseball. One of the earliest clubs formed was the Knickerbocker Base Ball Club in New York, which published its first set of rules in 1845. (Many historians acknowledge that the Knickerbockers didn't necessarily invent all of these rules, but rather were among the first to consolidate and publish them. The 'New York Game' came to become the most widely-accepted form of baseball, though other versions existed in this era, notably in Massachusetts and Philadelphia.) Much of the framework of modern baseball is evident in this set of rules, including foul territory, the basic layout of the field, three outs to an inning and the elimination of "soaking." Important annual conventions of the 'National Association of Base Ball Players' began in 1857, at which amendments to the basic Knickerbocker set of rules were made. It's important to note how the rules truly did grow out of necessity, game experience, and changes of opinion of how challenging the game should be. It wasn't until 1857 that the number of players active for each side was fixed at nine, for example, as well as the distance between bases officially set at 90 feet. Fans and historians alike have often marveled at how this precise distance creates so many close, dramatic plays at the bases. Members of the Knickerbocker Base Ball Club in 1845, including Alexander Cartwright (top middle) and Daniel "Doc" Adams (bottom middle). The role of the pitcher has changed immensely since the first rules of baseball were set down. At first, the game was largely an offensive one, as the pitching was underhand and it was the pitcher's duty to deliver a "hittable" ball. Balls and strikes were not originally called (with the exception of three swings-and-misses constituting an out) and a ball caught either in the air or after the first bounce would make the hitter out. The role of the umpire was much less than it is now, as he was primarily tasked with keeping the game moving and played according to a code of conduct. Often times, an umpire would only pass judgement on a close play if it was requested of him by the players. Painting of an early base ball game at the Elysian Fields of Hoboken, NJ, where clubs such as the Knickerbockers played. In subsequent years the rules continued to evolve. In 1864, for example, the "bound" rule was eliminated, making it necessary to catch a struck ball in the air in order to retire the batter. Pitchers began to slowly exploit and change the original rules of pitches, varying speed and location and applying deceptive spin to their hurls. Originally pitchers were required to release the ball from below the waist, and there is evidence that some pitchers began to wear their belts higher and higher to exploit the rule. Eventually, overhand pitching was allowed. The speed of the pitches greatly increased and pitch deception became part of the pitcher's essential role, leading to the necessity of balls & strikes being called, and thus also making the role of the umpire more vital. Nowadays the pitcher has the power and intention to dominate game play, but this was not the case initially. Two figures of note were especially important in the evolution of baseball in the mid-to late-19th century: Henry Chadwick and Albert Spalding. Chadwick was born in England and was an avid follower of cricket and rounders. However, in the United States he came to greatly enjoy and promote the burgeoning pastime of baseball. His contributions were largely that of a historian and writer. He edited a widely-distributed baseball guide, the Beadle's Dime Base-Ball Player, which helped spread the sport throughout the country and foster an appreciation of baseball's fascinating statistics. Chadwick is often credited with creating the 'box score' for baseball games. Fans could in some sense re-live a game through such information, making it even more compelling. Spalding was originally a baseball player, and a great one at that (as a pitcher, he won almost 80% of his games). Yet his more lasting contribution to the sport's history was that of a promoter and executive. He helped form baseball into a national league and thus from a gentleman's pastime into a professional sport. He also organized an international promotional tour to build interest in the sport, and was a fervent advocate for baseball as a business. Indeed, he was the man behind the Spalding sporting goods empire. The two men worked together, Spalding employing the older writer, but didn't always see eye to eye. After the turn of the century, some attention was called to how in fact baseball had been created. Chadwick published an article in 1905 that pointed towards baseball's evolution from the English games of cricket and rounders. Seeking a different, more patriotic, story-line, Spalding helped establish a commission to identify an American genesis for the sport. The Mills Commission declared in 1907 that the true 'Father of Baseball' had actually been a native of Cooperstown, New York: Abner Doubleday. According to the commission's findings, which cited the recollections of a onetime acquaintance of Doubleday's, Doubleday had essentially spontaneously come up with the rules of baseball one day in 1839. However, this story is now almost universally accepted as a near complete fabrication. Doubleday was in fact an important figure in history--a Civil War officer present at both Fort Sumter and Gettysburg, and later one of the first to take out a patent for the cable-car railways in San Francisco--but may have had little to no exposure to nor impact on the sport of baseball. Even the National Baseball Hall of Fame, which was built in Cooperstown in response to this mythical assertion, acknowledges the falsehood of the claim. Debates have raged on for years about these men and many others who have been credited with being founding fathers of baseball. It is a sport that lends itself very readily to being studied historically, in part because of the prominence of detailed statistics with which to compare players from different eras, but also because of the many colorful players and advocates that have shaped its development. It is also an extremely nostalgic pastime. Almost everyone has their own memories of having played the game at some point of their life, often from a very young age and often with very close friends and family. The history of baseball from the mid-nineteenth century to now has no shortage of fascinating story lines. It is widely accepted that the first professional club was the Cincinnati Red Stockings in 1869. Baseball as a business has produced its share of intrigue, scandal and fervent devotion from fans. Fan bases have lived and died by the successes and failures of their teams. But the sport has also lived on as an amateur pastime, both for children learning the game, and for groups of friends & neighbors getting together to have a match. The amateur beginnings of the sport present a very captivating era. The Monitors & Merries and other vintage base ball clubs aim to in part recreate that precise moment on the timeline of baseball's evolution, as the first clubs were forming and truly playing for the love of the game and the thrill of competition against neighbor squads. These modern vintage clubs at the same time present a dynamic and unscripted match game. Vintage ballists are half re-enactors, half sandlot baseball fanatics, and we hope you enjoy being transported back in time with us! For further reading & viewing, we highly recommend Baseball in the Garden of Eden: the Secret History of the Early Game by John Thorn, Baseball Fever: Early Baseball in Michigan and A Game of Inches: the Story Behind the Innovations that Shaped Baseball by Michigan's own Peter Morris, and the documentary Baseball by Ken Burns, along with its companion book by Geoffrey C. Ward and Ken Burns.